Call me an eager beaver, but I'm already listening to Christmas music- U2's remedition of "Christmas (Baby Please Come Home)" is quite spectacular! For some, this festive season does have it's drawbacks. For example, it gets cold. Very cold. I'm all for comfy clothes; however, the weather be an excuse for sporting some horrific threads. If you truly must sport a pair of leggings this holiday season, please "wow" onlookers with some amazing outerwear? Since I've taken the time to give you a style guide for winter accessories, you really have no excuse. When in doubt, stick with neutrals: Though I'm such a sucker for the rampant collection of cherry reds and emerald greens that bombard the freshly-plowed streets, set yourself apart from the rest and wear subdued hues. Trust me, you'll look super chic. If you really feel the need to add a splash of color, add a deep lip or a colorful hat. Texture, texture, texture: If you haven't noticed yet, winter is all about texture. Whether you sport a faux-fur jacket (in a neutral, of course) or some intricate gloves, a textured piece will add depth to your ensemble. Plus, it can be a great conversation starter. Don't neglect your socks: Gone are the days of rocking a pair of flats without the risk of frostbite. Though you may have to tug on your trusty boots, remember that your socks should be sartorially superior as well. Eventually, you will have to take off your shoes and nothing's more of a buzz-kill than standard white socks. My top picks? Madewell, J.Crew and Topshop. What will you be wearing this chilly season? Buddle up, my loves! By now, you should know that I simply can't resist a red carpet review. Though time has been a little tight lately, there is no way I can ignore what happened at the American Music Awards on Sunday. From home-run ensembles to horrific getups, Justin Bieber's rampant winning streak and Taylor Swift's questionable musical genre shift were the last things on my mind. Behold: my best and worst dressed lists. What looks are on your best (and worst) dressed lists? I'm dying to know! I don't just like blazers, I adore them. In my opinion, the sacred piece can do wonders for your ensemble. While most style mavens think of a blazer as a finishing touch to an already polished outfit, I can assure you that the treasured item has a lot more mileage. My tweed boyfriend blazer, which I will thank my mother for coercing me into buying it, always supplies an urban twist. But the versatility doesn't stop there: blazers can also exude fearless glamour. This week, I had the pleasure of meeting Madison Maxey, a designer who is on her way to becoming "The Blazer Queen." Perhaps I should copyright that before more people catch on, yes? With bold collars and a bevy of different fabrics to choose from, Maxey gives you the power to design your dream blazer. I know, how could it get any better? 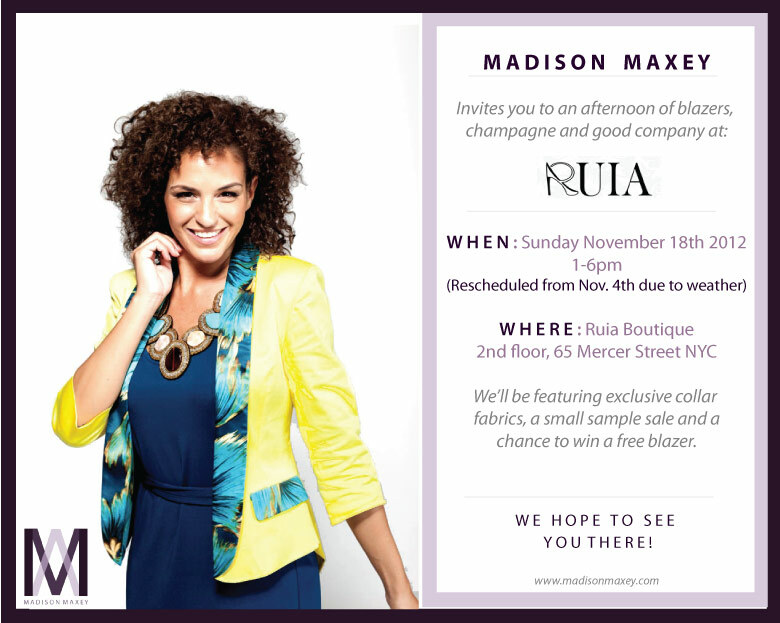 This Sunday, Madison Maxey is hosting a trunk show that's sure to make you drool. Whether you're starting your holiday shopping early or planning to snag seven blazers for yourself, you must go. Champagne, exclusive collar fabrics and possibly a free blazer -- how can you resist? Since I'm still in Boston, I expect all my stylish New Yorkers to attend, shop until they drop and report back!